One of the (now somewhat stunted) terminal pillars in its original form, supplied by the same company. Photograph of one of the ornamental cast-iron lamp pillars with the original gas lamps. This, along with the pedestals and parapet, were supplied by Walter MacFarlane & Co of Glasgow. Yes, I wasn't really convinced of the suggested date. Looking at the clothing I'd be more inclined to go for the late 18th century, sometime after the footpaths were added. View of the old bridge from the Strood side looking toward Rochester. Painting believed to date from around 1730. 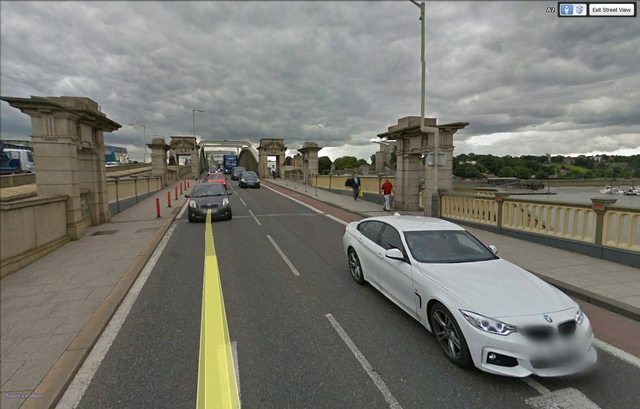 Looking at the Rochester Bridge Trust website seems to suggest the painting it is more likely to be 1830. "..... river traffic and the road traffic increased steadily, and in the late 18th century the Wardens and Assistants of Rochester Bridge extensively modernised the bridge. They widened the roadway from 14 to 26 feet and added a footpath on either side. They reduced the width of the starlings, so that larger boats and barges could pass through the arches; and most importantly they removed the sixth pier from the Strood side, along with the adjacent arch and drawbridge, and replaced it with a large central arch. The programme of refurbishment and modernisation of the stone bridge was completed in 1824." There is an amusing little detail in this painting - notice that the dog seems to be looking at something. If you follow it's eyeline up and to the left you can see the object of its attention - what appears to be the face of a cat looking straight at the artist. Also, does anyone have any idea what the two women are carrying? They look to me like they may be carpet beaters. That should be upstream ie towards Maidstone not downstream. Not quite....the medieval bridge was a little downstream of the current bridge. The same view would look more like this. Looks like a lot of lamps on the old bridge, too early for gas, must have been oil, the only oil I know available back then for lighting was, unfortunately, whale oil, also like what appears to be a woman with a spinning wheel in lower left hand side. Watercolour by John Wykeham Archer, 1855. In the middleground is the medieval bridge built in 1387-91. The derelict remains in the foreground and in the river are, I think, the remains of the Roman/Saxon bridge? The current roadbridge is built on the line of the Roman/Saxon bridge. © Trustees of the British Museum. Museum number 1874,0314.456. Rochester Bridge and Castle; arched bridge to right crossing Medway River, with ruins of castle to right among trees, tower of cathedral to left in distant, barges on river in foreground. 1855 Watercolour. Smiffy, that’s exactly what I had in mind. Thanks. The third paragraph of Nemo’s link describes the roller path and also an 11 inch diameter screw for elevating the centre of the apparatus. All I can think of is that the whole swinging section was raised a few inches to lift the ‘free’ end off whatever it rested on. Any other ideas?